The 7A3 was a hip hop group based out of Los Angeles, California, which released one album in 1988 called Coolin’ in Cali. It was composed of brothers Brett and Sean Bouldin, and DJ Muggs, who later achieved greater fame with Cypress Hill. All originally hailed from New York—Brooklyn and Queens, respectively. The group’s sole album and two of its singles performed moderately well on the US charts. The group’s song “Mad, Mad World” was released on the Colors soundtrack. In addition, the group’s version of “Take You Back” was featured on the Rocky V soundtrack album. 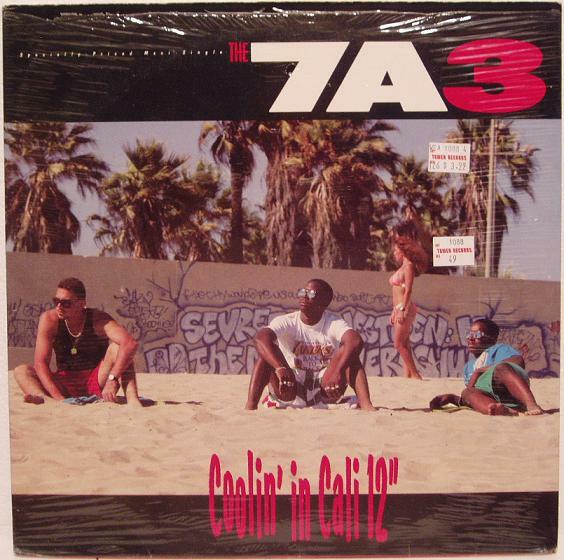 The 7A3’s debut single on Geffen Records was the title track from the album “Coolin’ In Cali”. Mixed by Eric “Vietnam’ Sadler and Hank Shocklee who had already worked together on early Public Enemy including the classic “Bring The Noise” and the LP “It Take A Nation Of Millions To Hold Us Back”.